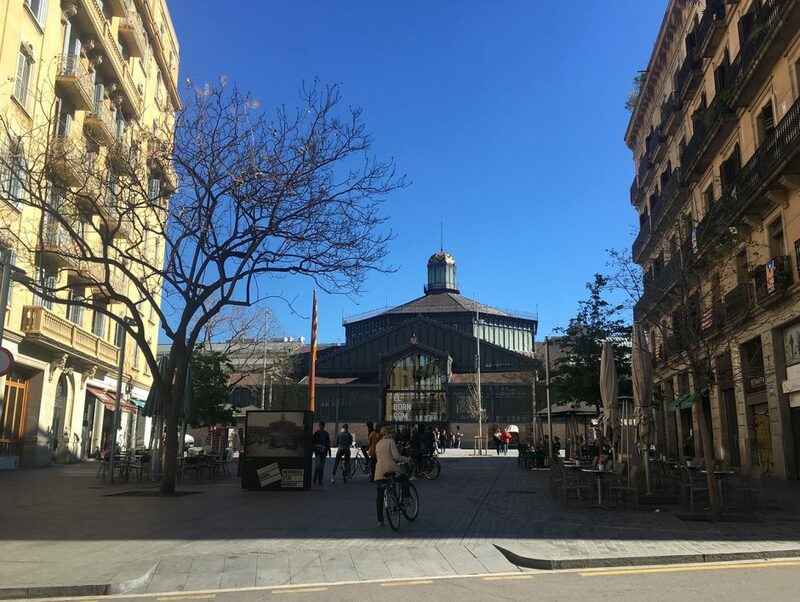 Barcelona's Best Kept Secret: The Creative Neighbourhood Of El Born | To Work Or PlayTo Work Or Play | A blog of two halves: Lifestyle guidance for city-savvy socialites, and insight, inspiration and opinion for ad-curious folk. Gothic meets contemporary in Barcelona’s arty area of El Born. Here Nat gives you details on where to rest your head, eat and how to make the most of the culture in the unapologetically cool neighbourhood. Having previously been to Barcelona and not really rating it I was surprised when my parents went and absolutely loved it. The difference is they had stayed in an area unknown to me at the time, this was the beautiful district of El Born. 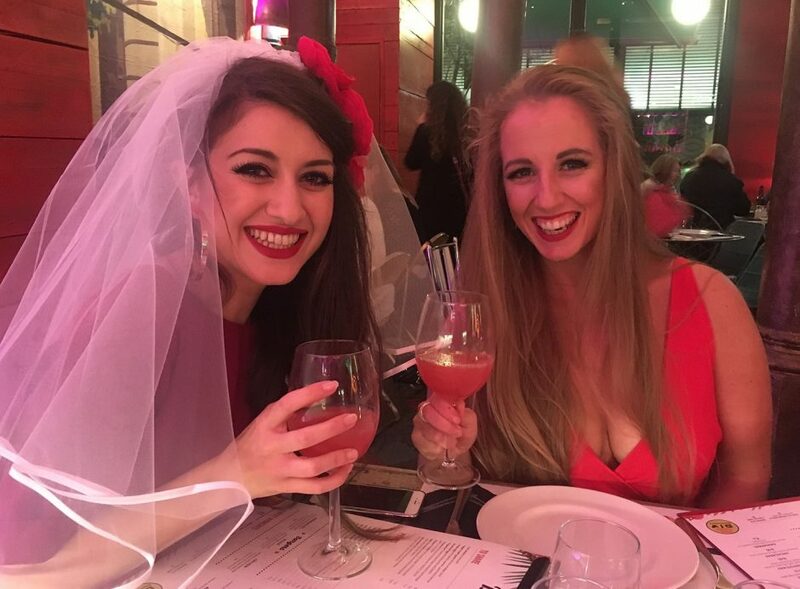 Now when I say we went to Barcelona for a hen do don’t get the wrong impression. 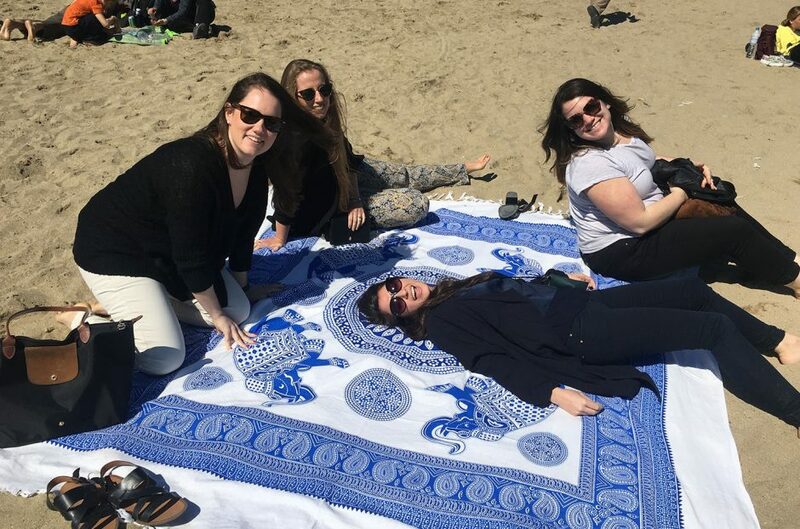 The word “tacky” and the connotation of this was banned (strict orders from Firuze) and instead organised a girls trip with a sprinkling of hen fun. Therefore this guide can be used for a romantic break, family trip or friends holidays alike. 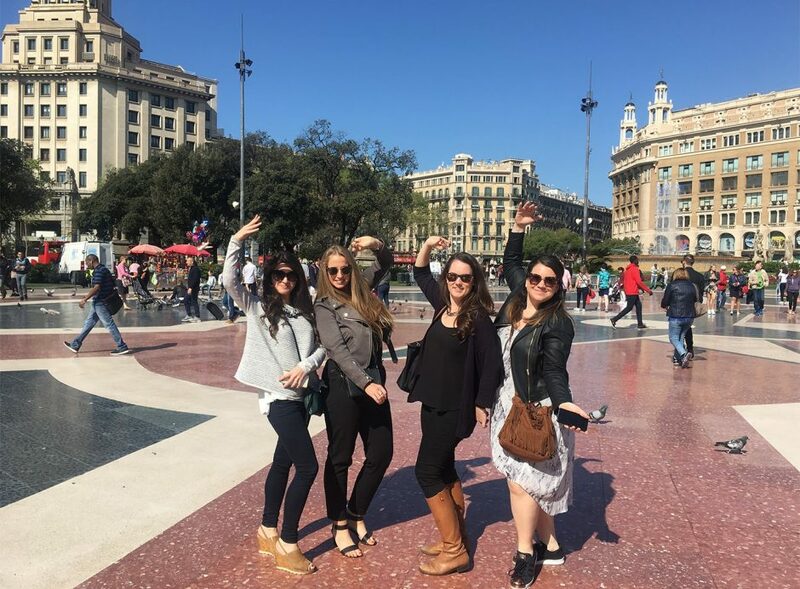 Here I give you a 72 hour guide to the sunny city of Barcelona. 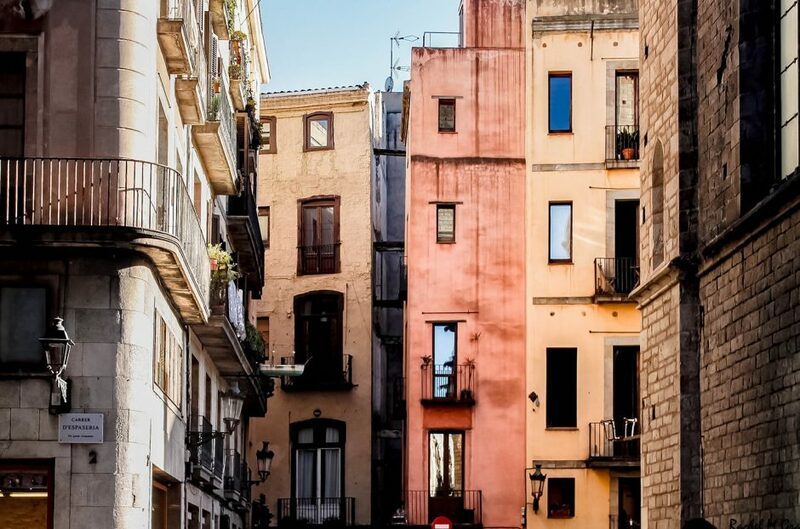 Once an area known for medieval jousts and celebrations, El Born has grown into one of the most desirable spots in the city. Colourful street art compliments historic buildings with a mix of contemporary offerings amongst historic monuments. 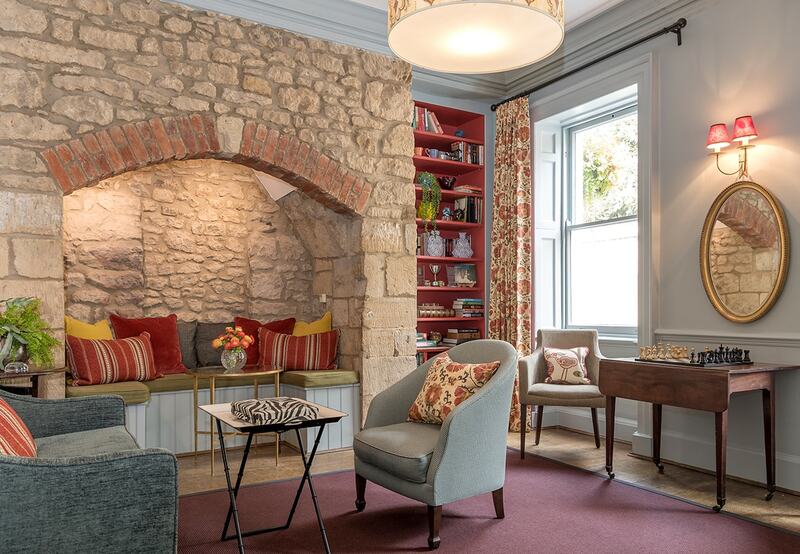 Remnants of gothic architecture can still be found scattered along the small winding streets, but these characteristics have been cleverly mixed with modern styling and rustic interiors. The unique nature of this area means everything you come across is cosy, quirky and above all different. 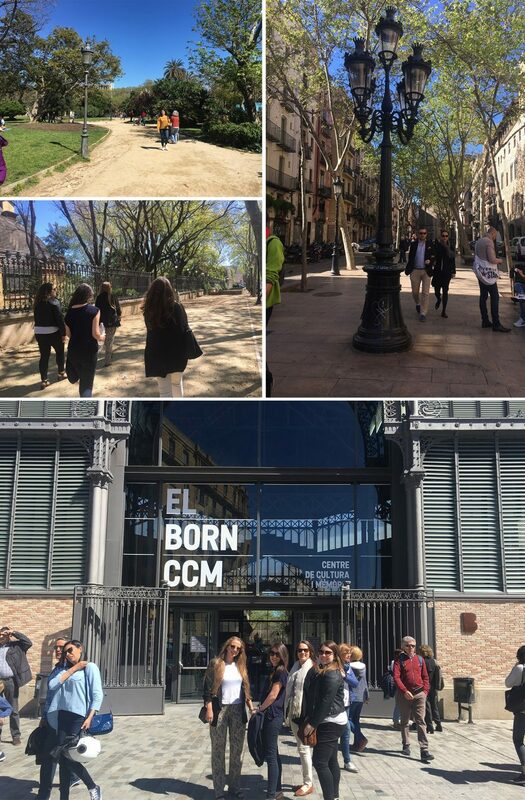 Over the years El Born has grown into becoming one of the most fashionable places in the city, hosting a thriving creative and artistic community with dozens of small museums, galleries and designer boutiques. Pedestrianised streets weave through medieval buildings and are packed full of little delights in the form of bakeries, quirky cafes, vintage and design stores. Speciality markets are next to trendy bars and ice cream stores neighbour with gallery spaces. From day to night the area is known for its lively atmosphere. With a buzzing nightlife bars and cafes enjoy a constant influx of friendly customers and locals alike. 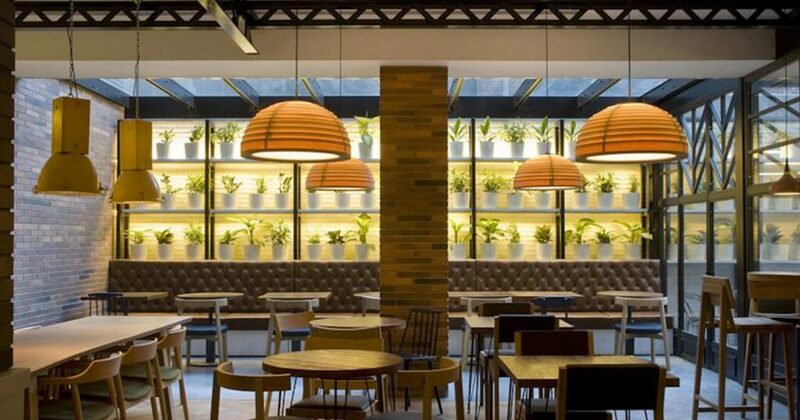 Great food is easy to come by with a plethora of restaurants from local tapas to Japanese noodles, Italian pizza to Mexican tacos there’s a lot on offer. Wander along Passeig de Born and you can stumble into any one of a number of cocktail bars with friendly staff ready to please. 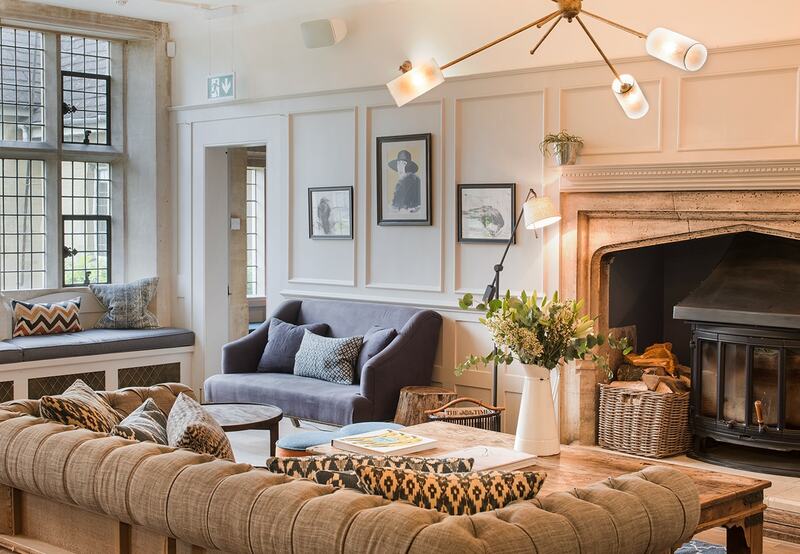 Venture further down the road and drink on the rooftop of a stunning hotel or venture into a local wine bar – There’s something for everyone here! 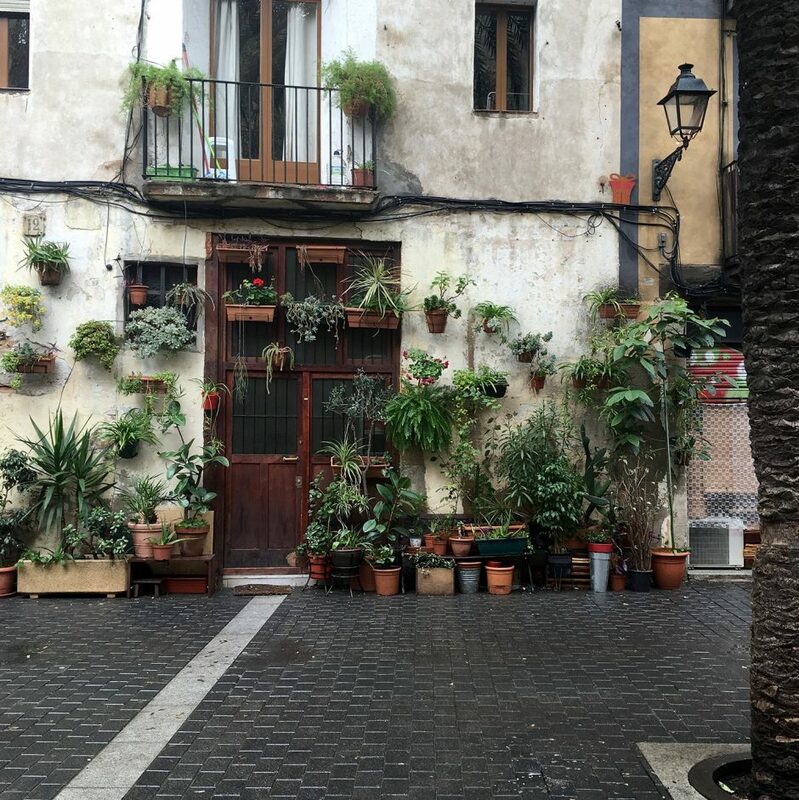 Nevertheless El Born isn’t just known for its nightlife. With plenty of culture and an abundance of green space this neighbourhood has it all. Parc de la Ciutadella sits at the top of Born and boasts lush gardens ideal for picnicking, along with a Catalonia’s regional parliament, the city zoo and picturesque lake. 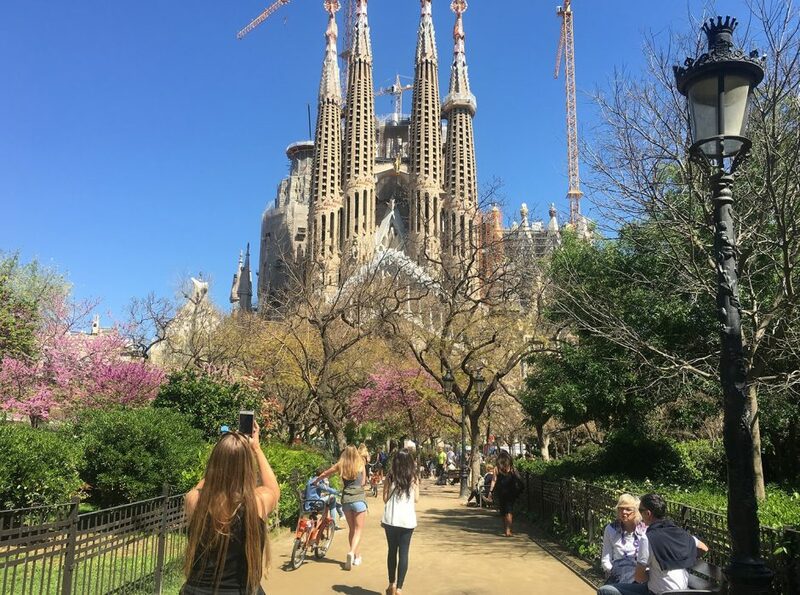 Attractions like Museu Picasso and Mercat del Born sit amongst beautiful churches and monuments. For energy, style and charisma, El Born boasts it all. Luckily for us we stayed in the middle of the action in an apartment on a side street leading directly off Passeig de Born in the Habitat Apartments Born. As there were 5 of us staying we got a 2 bed apartment with a sofa bed in the living room. 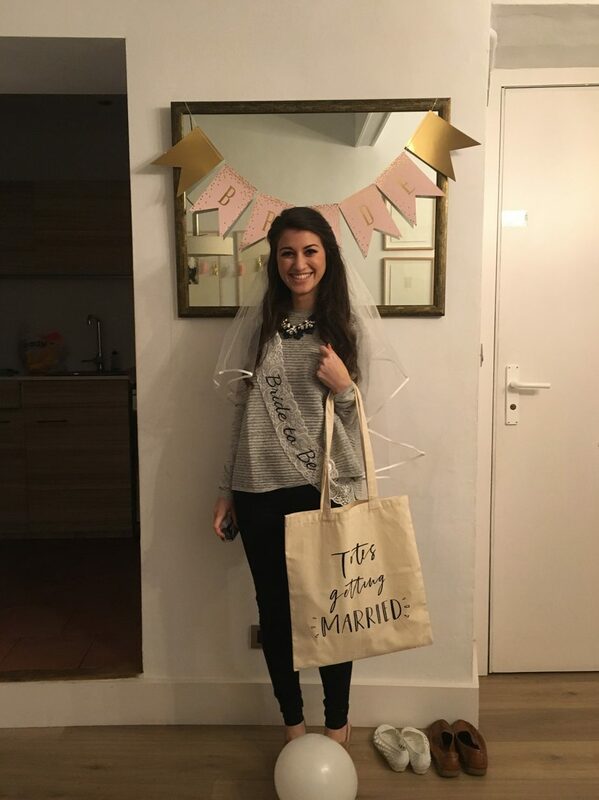 From booking to leaving the process was very smooth and the Habitat Apartment group were very accommodating, especially when we needed to check in at 11pm! The flat itself was exactly how you see it in the pictures, although a little dark as it’s down a tiny side street which doesn’t get much sunlight. The only other niggle is that for the person sleeping in the living room (me) it’s a tad noisy around 4am as the streets get cleaned, but to be honest I loved the fact the area was so clean all the time, so got over this pretty quickly – especially as we were out a few nights till this time so I didn’t notice. Haha! Some other apartments I found around the area included Inside Barcelona Apartments Esparteria and Deco – Born Studios. There’s obviously Airbnb to explore in the area also. For something a little more luxurious try The Grand Hotel, K+K Hotel Picasso or Boutique Hotel H10 Montcada might take your fancy. For a reasonably priced, quirky hotel overlooking the park try Chic & Basic Zoo or Chic & Basic Born just around the corner. Alternatively Hotel Banys Orientals and Hotel Suizo looked great and have good offers also. For a cheap hotel that’s pretty central to the area have a look at Hotel Ciutat. Hotel Pulitzer (which I wrote about in my Amsterdam travel guide here) is located close by in the neighbouring area of L’Eixample and Hotel The Serras (which has a Michelin star chef and stunning rooftop bar and pool) overlooks the beautiful nearby Port Vell Marina. Brekkie: This was easy! Luckily for us our apartment was literally next door to a world renowned bakery called Hofmann Patisserie. Try the mascarpone croissant for €2 and pair with a cappuccino. 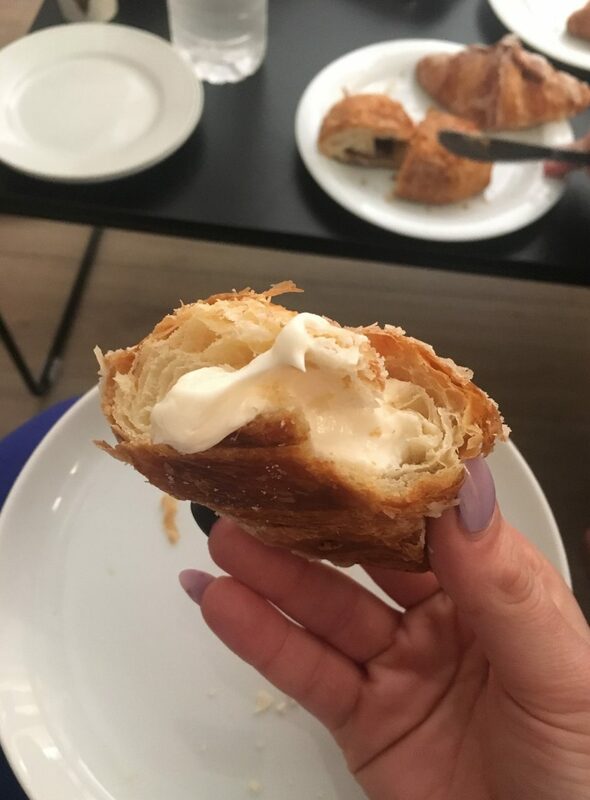 Arguably the best croissants in Barcelona, if not the world, these little delights kept even the most hungover hen happy. For early morning churros try Churreria Laietana or have breakfast sandwiches, cakes or eggs at Elsa y Fred. 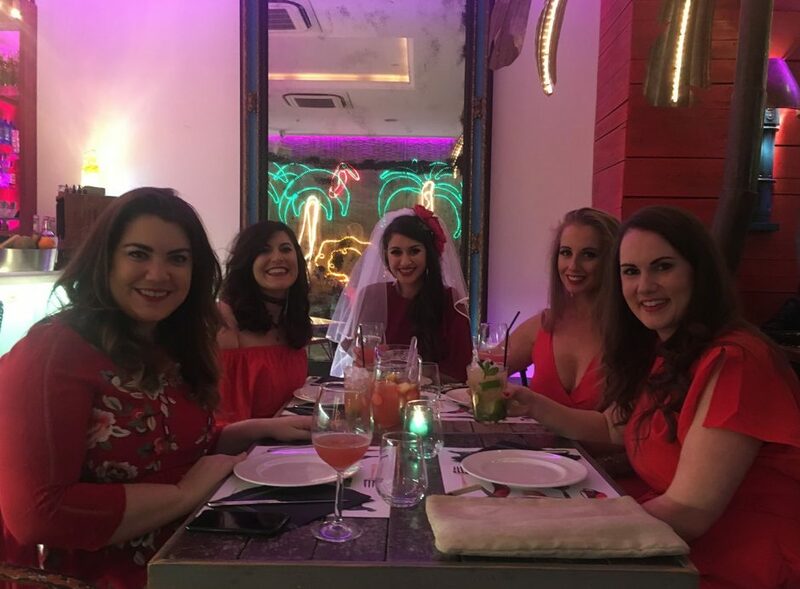 Lunch, dinner and drinks: Saturday night was party night, so with that we decided to bounce around a few different venues. We started at Bananas, a fun and vibrant bar and restaurant next to El Born Cultural Centre. 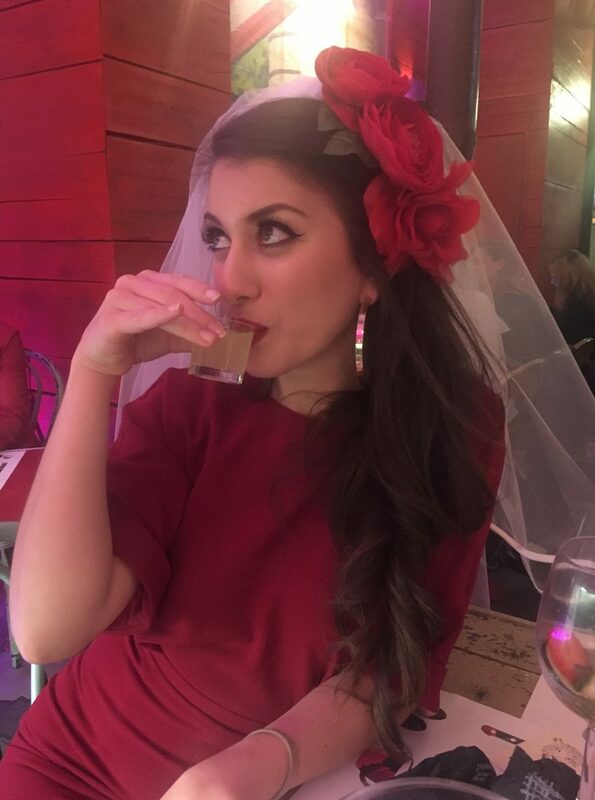 We shared a few tapas dishes and had a few cocktails to get the party started. 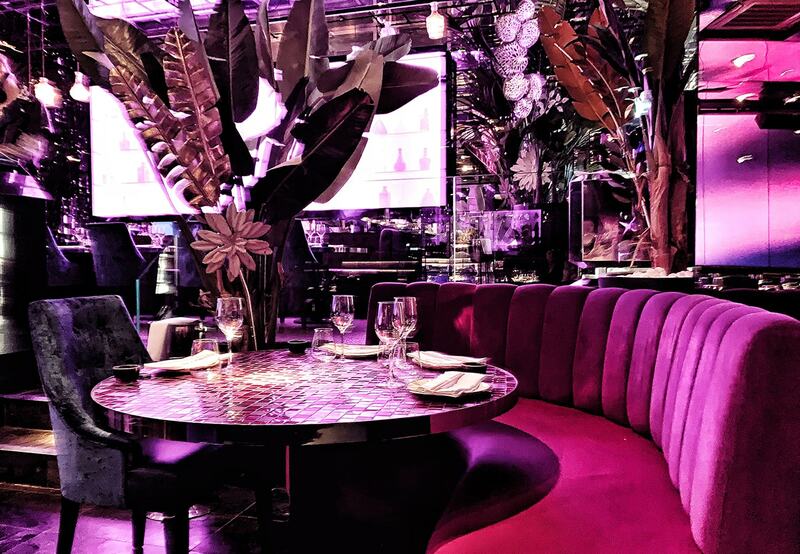 The highly colourful dining room is clad with neon fittings, palm trees and a Mexican vibe which immediately puts a smile on your face as you walk through the door. This venue is actually quite deceiving as it’s pretty huge which I discovered during a bathroom trip. Cafe Kafka, Bananas sister bar, is situated next door so you can literally hop over there for more cocktails once you are done eating. Walking down the street we stumbled on Bar El Born where helpful staff found us a tiny area to enjoy espresso martini’s until a table became available. Leaving here around 1:30am we walked over to El Paradiso where we had some very unusual cocktails drinking out of shells and ice bird sculptures until 4am. We tried to make it to Collage Art and Cocktail Social Club where I have heard nothing but good things, but we simply ran out of time. Would recommend giving it a go though! One of our favourite meals was at Llamber where we indulged with a huge array of tapas in every shape and form. 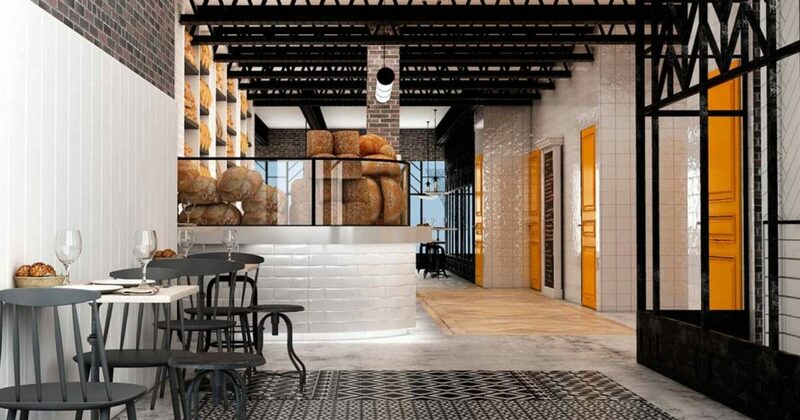 The cosy dining room and bar has a industrial style which is reminiscent of New York. The eatery is split into two sections, the first being a more casual bar area with high tables, and the back having lower tables for bigger parties. We went late on a Sunday evening and the place was fully booked, but after some gentle begging the staff cleared away a high table at the front and five starving ladies tucked in. The concept is simple and based around sharing where each dish can be adjusted to feed your party. Taking this on board we ordered food for 5 and then threw in a few extra dishes… because we could. 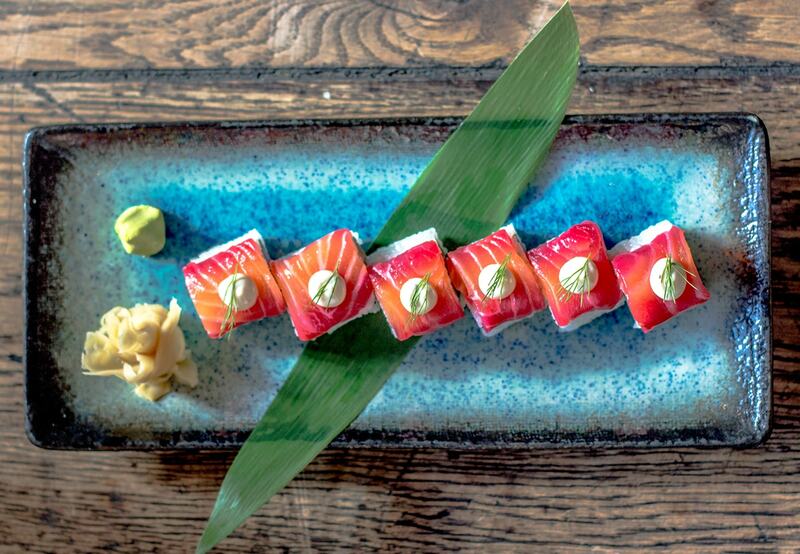 I would recommend trying the mushroom croquettes, cheese and truffle gnocchi, tuna sashimi and ceviche. They also had an interesting take on patatas bravas that split the opinion of the group, but I’ll let you decide! Drinks-wise try the Basil Smash cocktail (refreshingly delicious) and after your meal have Baileys coffee or “carajillo de baileys” in Spanish. 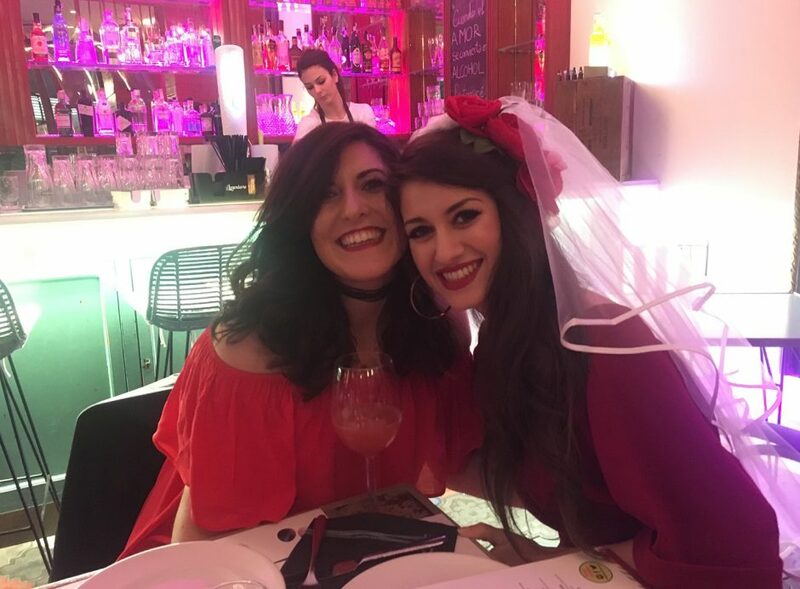 After a lot of food and a considerable amount of alcohol drunk by 3 of us (some people were too hungover to drink again) we were pleasantly surprised when the bill only came to around £35 a head. 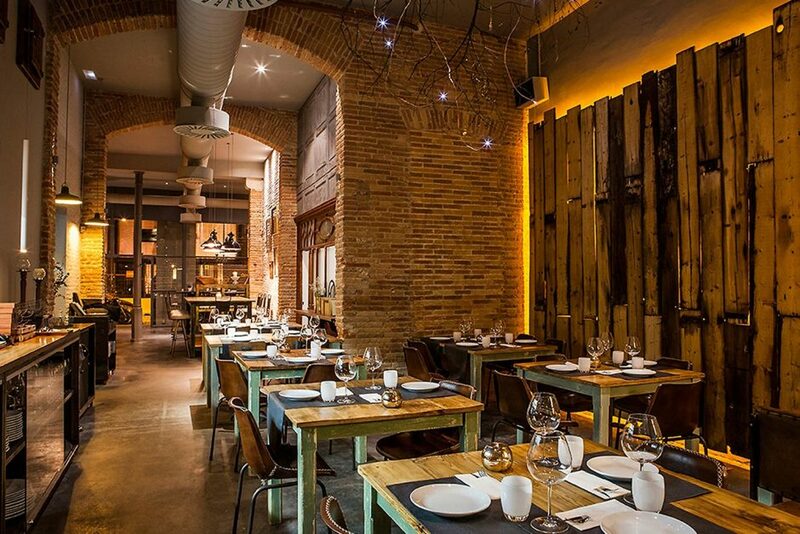 Highly recommend trying this restaurant for Michelin quality inventive tapas – a great little find! Alternative restaurants I had on the hit list included Le Cucine Mandarosso for the best rated Italian around the area, Casa Lolea for relaxed tapas and Ten’s for a more fancy affair. You can also try the restaurant at The Grand Hotel which looked pretty snazzy. Indulge in an afternoon cheese and wine session at La Bona Sort or try the tapas street food market at Mercat Princesa. If you want a cuisine less authentic to Spain head to Koku Kitchen Buns for Japanese Ramen or Mosquito Tapas, which specialises in homemade Chinese dumplings and hearty Vietnamese dishes. 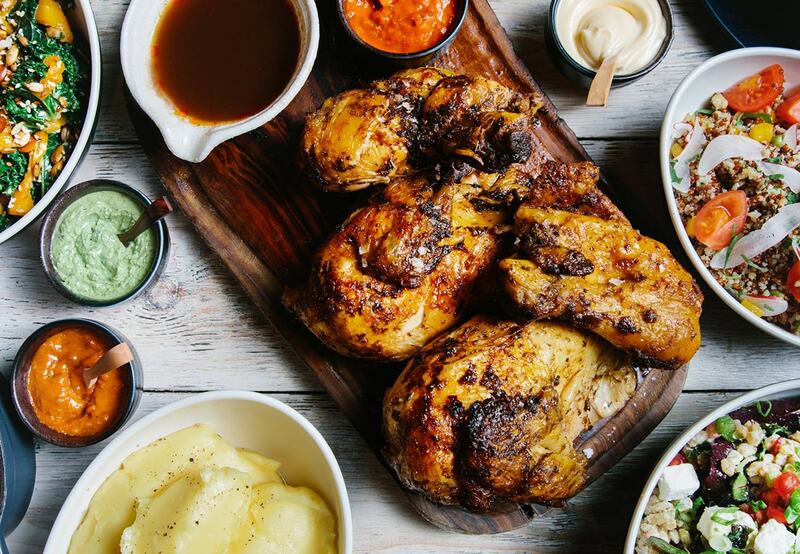 It’s safe to say El Born has a bit of something to please everyone’s food cravings. Ole! We did venture out of our area to eat… admittedly only on our last day. We found a small cafe for lunch before we left the city called La Esquina which did a great selection of brunch and lunch dishes (brilliant chips). 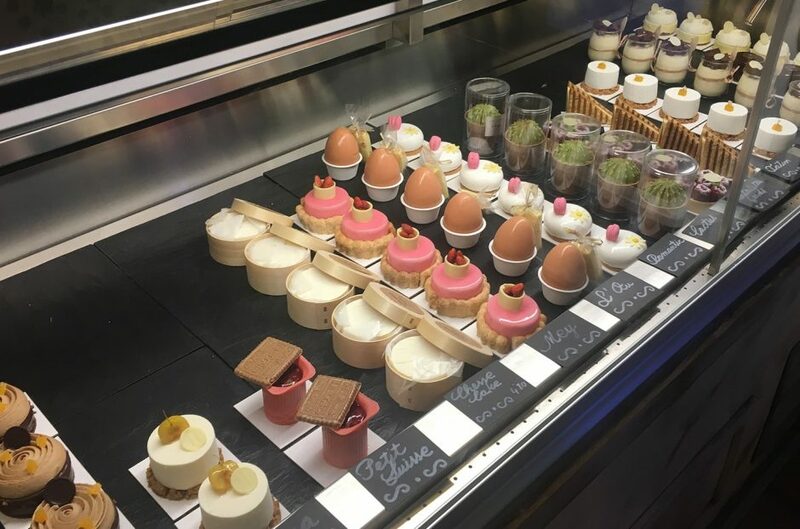 After venturing to Sagrada Familia we scoped out the area for a quick snack and found the beautiful bakery at Hotel Patrik. The hotel itself is a dreamy interior oasis with a wall of plants, black metal beams, exposed brick and an inside/outside conservatory feel. The bakery does high quality cakes and sandwiches that can be ordered from the front counter. 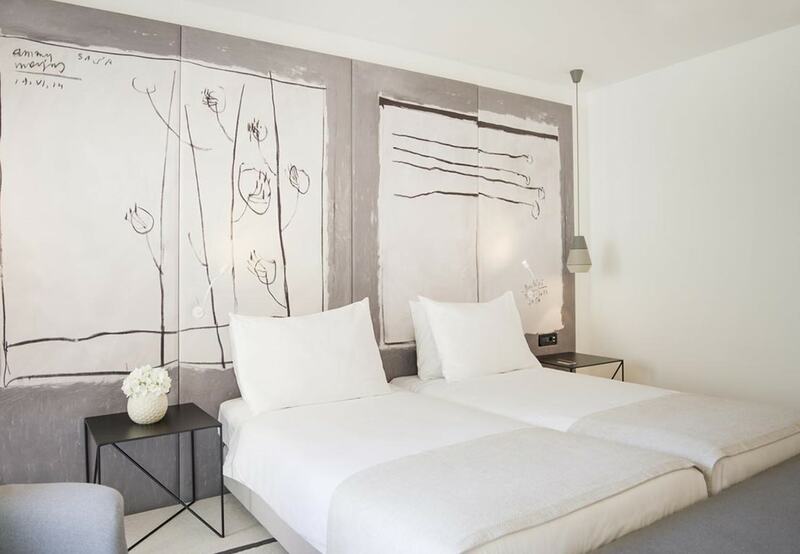 The hotel is wonderful and is set along the tree lined streets of L’Eixample – an elegantly stylish and posh area of the city. Although Patrik is outside of El Born, I would consider it next time I visit the city (just maybe). 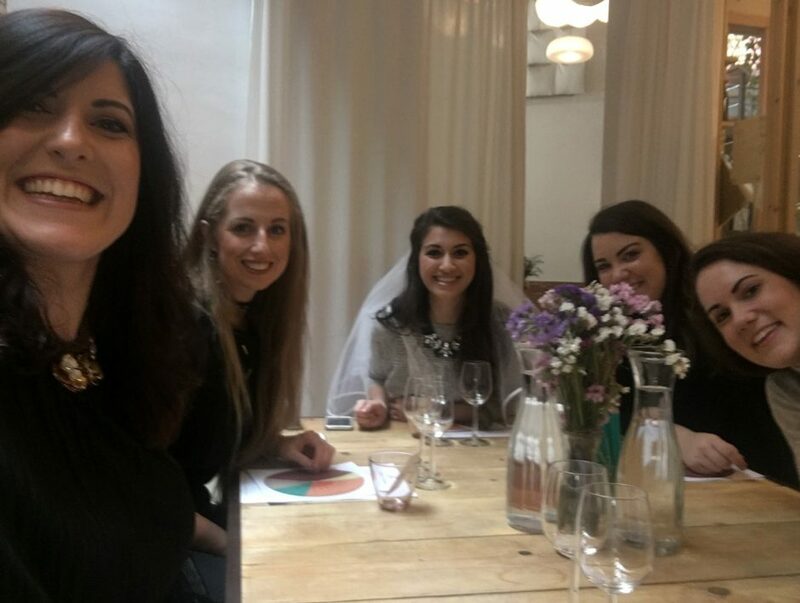 I had planned two activities for our mini break, the first being a wine tasting course. 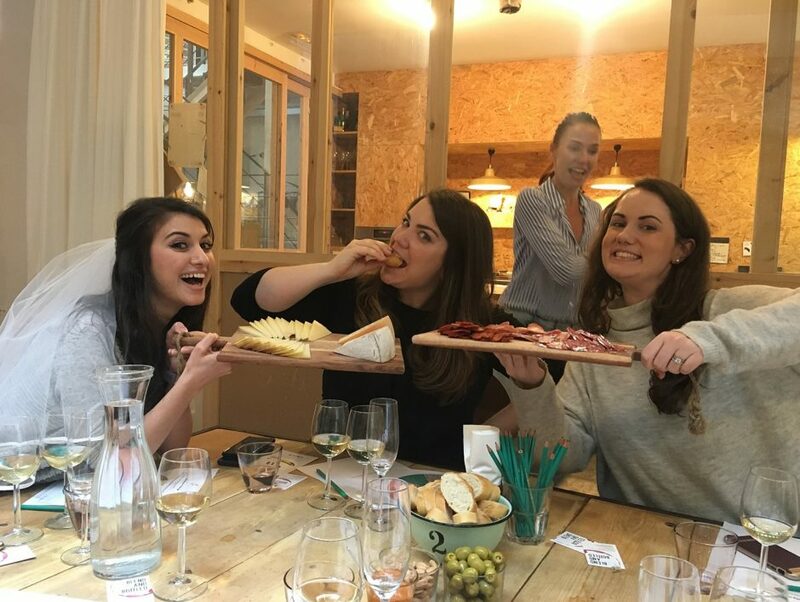 After enquiries with a few different venues and realising we couldn’t really go to a vineyard with the limited time we had, I settled on a wine tasting in the city and found Claire from Blend and Bottled on Tripadvisor. She came highly recommend and I now see why. Luckily Claire hosts classes in a shared workspace in El Born so it seemed pretty perfect to me. We arrived at the address, down a winding road at the other side of Born. 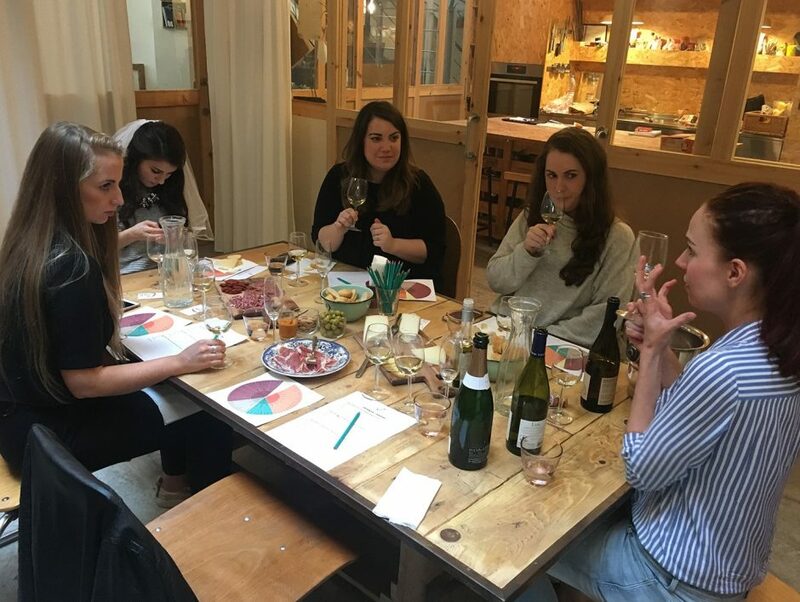 The shared workspace that the wine tasting is hosted in is achingly cool and would sit comfortably amongst ad agencies in Shoreditch. We headed to the back room and sat around a large wooden table laden with wine glasses. 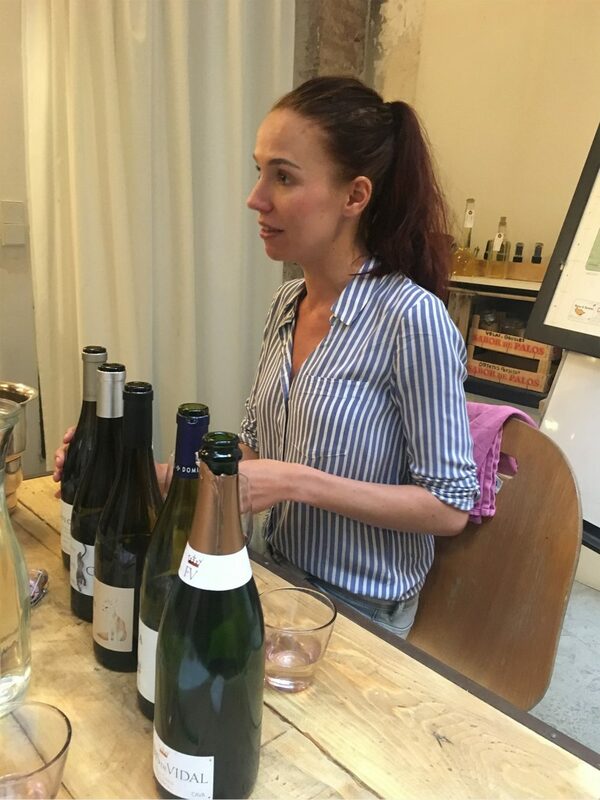 Claire took us through an array of different wines, teaching us about their qualities, what makes a good wine, the process of sparkling wine and the difference between the regions. Halfway through she brought out a tasty charcuterie platter to replenish us ready for the next round of wines. 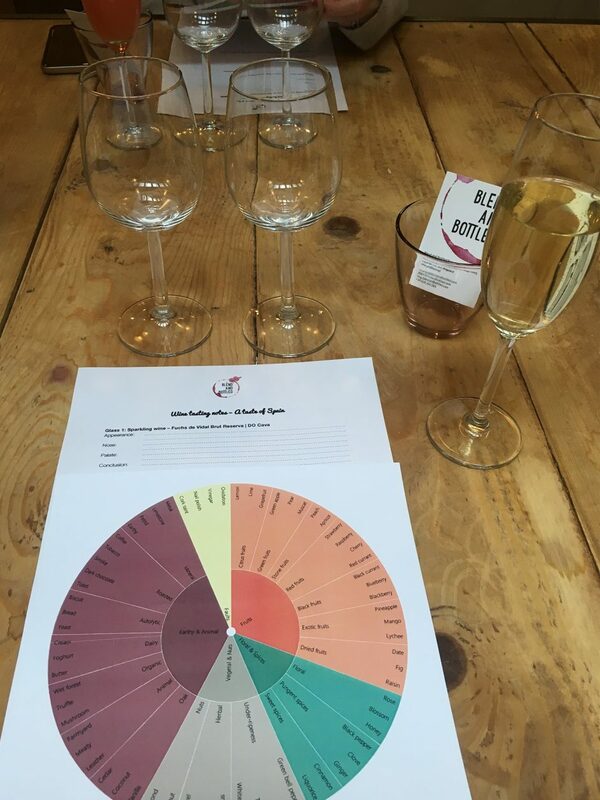 We started with a smooth local cava (so delicious that Vanessa will be having it at her wedding in Madrid), then tasted a couple of whites, couple of reds and finished with a dessert wine. The session came in at around €50 per person. It was a brilliant experience and you should definitely try this (trust me)! For more information contact Claire directly by email here. Before going to the third activity (below) we stopped off at The Grand Hotel for drinks on the stunning roof terrace. You can’t book this, but if you go in and ask them nicely the friendly staff will guide you to a table overlooking El Born’s stunning skyline. We loved this place and even resisted jumping into the infinity pool – just! The second cultural activity we did was a Flamenco show at Palau Dalmases. 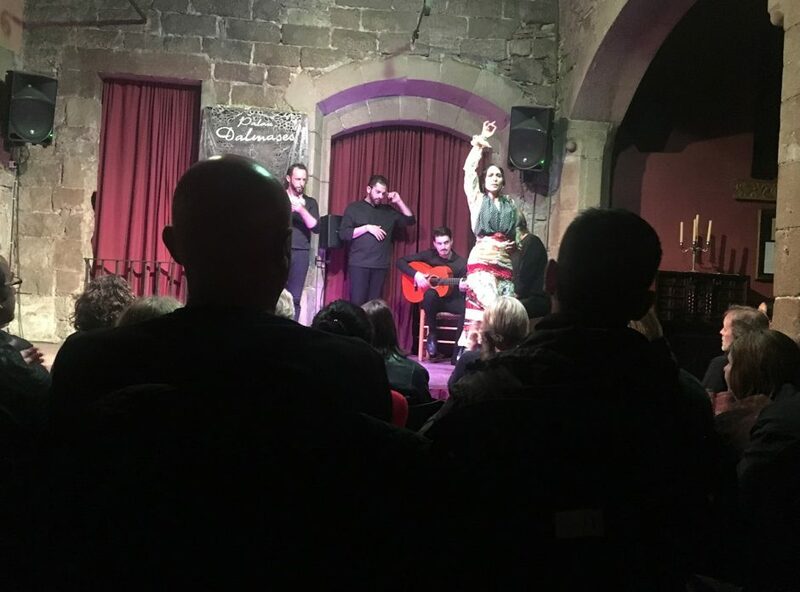 After a little research I discovered we had access to a traditional Flamenco show right on our doorstep – almost literally. The show, a 2 minute walk from our apartment, was set in an old art academy in the old quarter of Barcelona. The stone building was within arches and hidden behind a larger wooden door that led into a picturesque courtyard and onto a small bar and performance area. Huddled around the stage we collected our drinks (you get a glass of wine or soft drink with your ticket) and sat to watch the performance. It was dramatic, romantic, fascinating and totally authentic. We were mesmerised from start to finish by the performance set to a backdrop of live singers and the soothing sounds of the Spanish guitar. At €25 each this is another experience I would very much recommend. El Born is also conveniently close to the beach. To have a beach in a city is a complete novelty and I would definitely suggest taking a walk down to the coast one day. Along with the beach Port Vell Marina is also within walking distance and is definitely worth a look – mainly to drool over all the multi-million pound yachts! As we did most of our travelling by foot we didn’t really use public transport until the last day when we got a bus to the airport. If you go to Plaça Catalunya you can catch the 30 minute Aerobus for the bargain price of €5. Buses come every 5 to 10 minutes. Alternatively taxis are around 20 minutes for around €25 from the airport direct to El Born. If you are travelling later in the day and want to store your luggage, do what we did and store luggage in a locker at Locker Barcelona in the Gothic Quarter. It really does make a difference not having to drag suitcases around while being a tourist and for the grand total of €12 for an XL locker we could all store our bags in for the day, it was worth every penny!